My niece likes to "cook" and "make" tea, she has her own stove complete with cook wares, spices, condiments, ingredients, table wears, utensils, 2 sets of tea ware. Her favorite is tea party, if she's "making" tea, you must "drink" it, usually her dolls are the main guests, I am just there to fill in. Whenever I make tea with my little pots and cups, she'd join me with her own teaware. We often toast with a cup of tea too. Nothing is too silly with her. 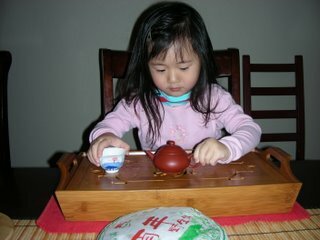 I have 2003 pu-erh stored away for her 18th birthday, also 2006 for my nephew too. My attempt to introduce tea drinking to both of them, and preserve some thing rather special for years to come. I got this sample from YHF a couple of months back. Yes they give out samples SOME TIMES. What a pretty name, poetic indeed! This is a fully fermented red tea (black in English terms). 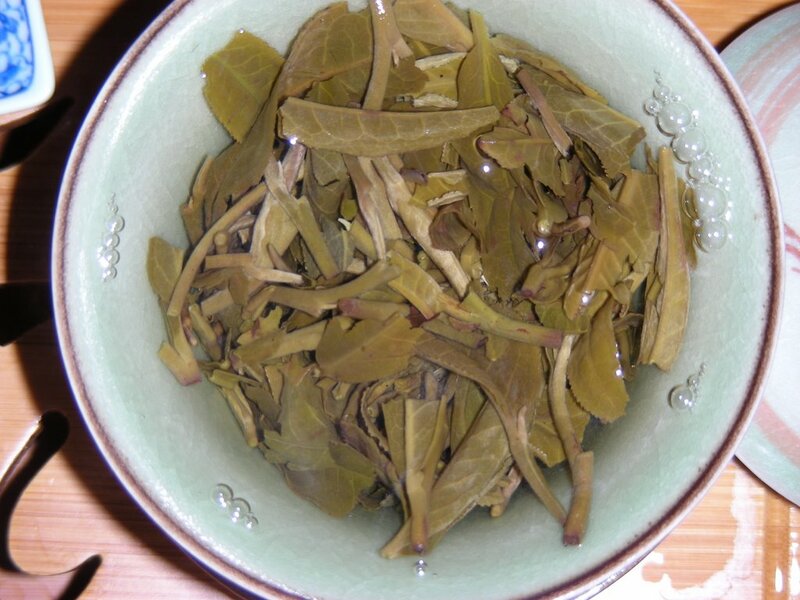 The dry leaves are quite attractive, uniformly long and slender, appear to be young leaves, smell like sweet dried lichi fruit, caramel, and a woody aroma typically associates with red tea. 2 oz, gaiwan, boiling water, 5s, 10s, 10s, 15s, 30s, 45s, 60s. Tea is medium amber in color, clear and smooth texture, sweet fruity taste, light aroma of a prune and dried lichi mixture. It develops a different taste in every brew. I find this to be a gem in YHF for as little as $30 per lb. 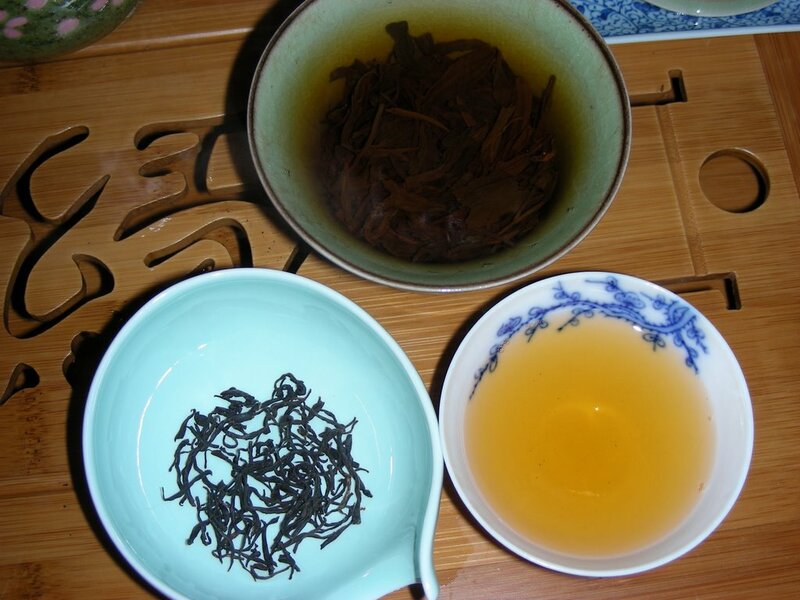 The taste and leave grade are both more superior than Da Hong Pao at $50 per lb from the same store. I am not much of a red tea drinker nowadays, however this is one of the red tea I would definitely like to stock up. It'd make a cup of good milk tea with more leaves for stronger taste. I hope everyone had a wonderful Chrismas holiday! Mine was relatively easy, 2 parties with deliveries and a case of wine, many guests brought wine, so we drank almost 2 cases. Tea was not on the menu though. Both Chrismas eve and day, I didn't get out of my parent's house a bit. It was laid back and family alone time! 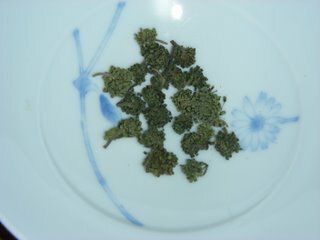 My girlfriend's mom came back from Hong Kong a week ago, she brought back these Tien Chi dried flowers for me. 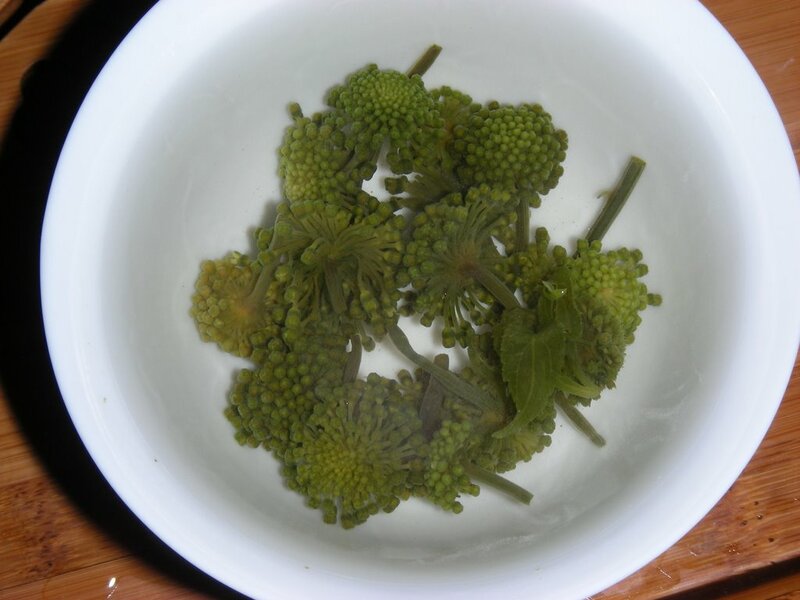 They look like little broccoli flowers. I steeped 10 flowers in a gaiwan filled with hot boiling water for 2 minutes. Tea tastes like American Ginseng, sweet, hint of bitterness leaving a cool feeling in back of tongue. Very soothing in mouth and in stomach. This will be my new comfort tea, replacing Kuding tea, because it's less harsh in taste. Tien Chi - Araliaceae ginseng plants 田七, an herbal medicine grown only in Yunnan and Guang Xi province China. Raw Tien Chi can help stop excessive bleeding, disperse bruise. Cooked Tien Chi prevents blood clog, coronary disease; enhance blood circulation. I discovered a key at my mail box today. A key for large package storage lockers. In side the package is a very lovely aromatic candle from a friend of mine whom is also a tea fanatic. It's a green tea lavender scented candle in creamy white soy base. It sounds almost edible, doesn't it? It smells quite interestingly nice, floral comes through first, not a strong lavender smell tho. When lit, it smells like a soy based matcha drink with brown sugar. Yummy! Thank you G! I am sooo tea drunk right now. My head is light, my knees are weak, my heart beats fast (I took a HOT bath too). So I took a walk along the canal of Naples Island in the middle of the night. A storm came on shore couple of hours ago, cleaned the forever smoggy air here. The street is clean, air is fresh, the moist air is nourishing, wind is still blowing, all of which made my midnight leisure stroll so much more enjoyable. 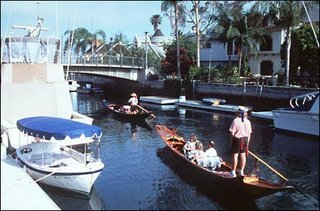 Naples Island is a neat little area where water canal runs through the island along houses. Kinda like a mini Venice but much better. You can even take a gondola ride with a bottle of wine and serenated by your boat captain. Half of the houses are decorated with elaborate Xmas lights at this time of the year. It's such a beautiful night to walk around here, beautiful architectures, landscaping, boats on the water, reflection of the moon and clouds on the water, quite and occasional laughter from distant houses across the water way. I smell alcohol walking by a house full of partying crowd. Here are a few tea I had through out the day. 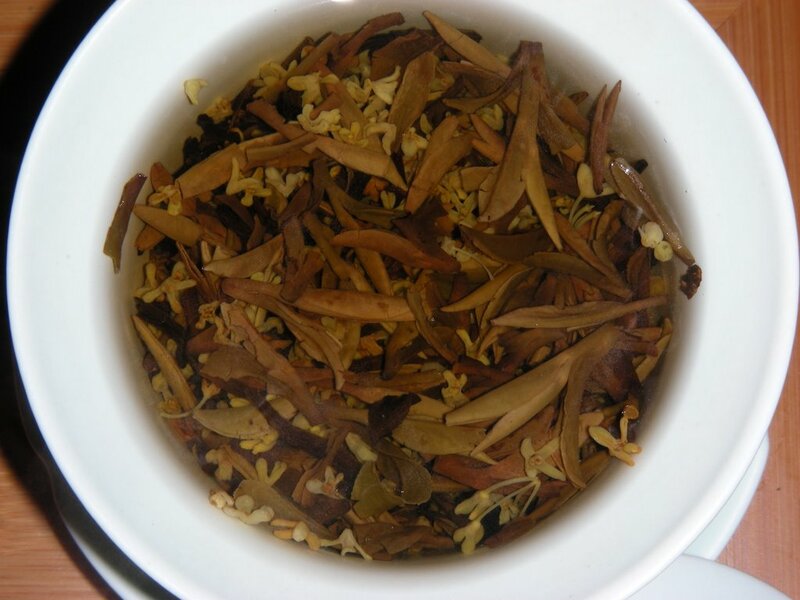 Mixture of loose golden tip pu-erh, Lung Jing and osmanthus flowers. 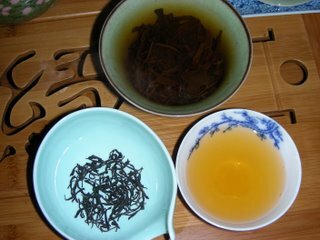 I did not like the pu-erh by itself, so I re-roasted it with some of the "old" LJ, the result was I over roasted them, then I add osmanthus flowers to mask the heavy roasty taste. Mouth feel is very smooth and eventually became sweet after the 5th brew. Zhuang Minority Girl Pu-erh, golden bud tribute cake. Young tender leaves, I couldn't stomach the cha qi of this raw cake. King tea biscuit from ancient tea tree from Qing dynasty, Lung Yuan Hao. 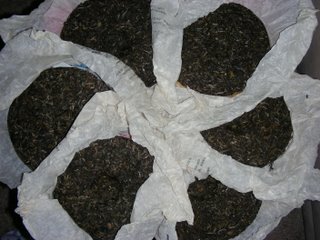 An other raw very green strong cha qi pu-erh. I also had some Orchid Dan Cong. This tea is the most difficult to brew consistently. The orchid aroma shifts from brew to brew, cup to pot, various temperature. I was captivated by the first impression of the fragrance, so I kept trying it for the last few days. I over did tea today, and everyday in the past week. Any one know how to get rid of tea drunk? My obsession with tea has been transcending from drinking just because it's a custom, to Kung Fu tea, to tea art, to history, until tonight, Chinese tea influence by market share. 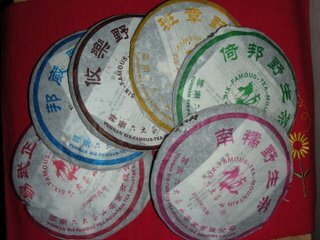 I spent a few hours searching for tea related articles in the Chinese sites, which I usually hate because of all the flash, popping icons, annoying music and more colors than a rainbow designs. I found one article that's quite inspiring. China is #1 in tea growing land space, #2 in tea production, #3 in tea exporting, #4 in foreign money earning by tea trade. China is at an embarrassing situation where it's the largest tea country yet not the strongest in market share. 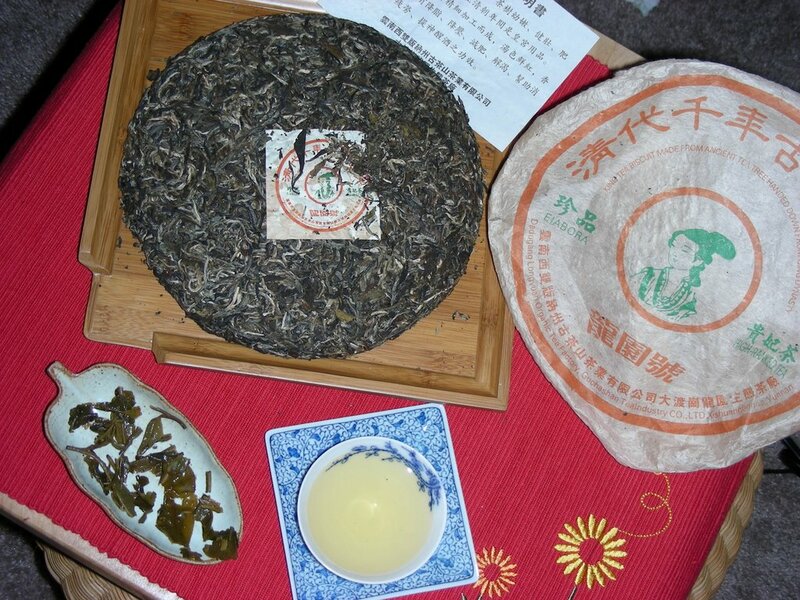 The unknown author pointed out 5 mistakes China tea industry make in promoting/marketing tea globally. 1. Branding. European successfully brand and market a product that not a leave is grown on its soil, however China operations are still "mom and pop" operated. Corporate management is still at its youth in China. There isn't a financially strong enough corporation to brand its name globally. The Chinese government should play a major role in establishing a foundation for the country's sake, rather than numbers of small players trying to make a dot in the global market. Sort of like the Farmer's association here in America, uniting individual farms to organize/control production, implement central marketing strategy, gathering and transporting. "Got milk? ", "Pork is the other white meat!"! Something to learn from eh. 2. Positioning. Since the 80's, Chinese tea faced strong competition of coffee, juice, and bottle water, all relatively young drinks comparing to thousands years old tradition. For over 4 thousand years, tea is an irreplaceable item in China, its position is determined by consumer, tradition and culture. We can achieve that globally, not as a fashionable trendy thing, but a necessity household item as well. 3. Art over business. Instead of promoting tea on a pedestal, it should be an everyday practical necessity, ie "English breakfast". Something that everyone enjoys on a daily basis without digging a whole in a wallet. Many middle class American can bare an inflated tea price, however $30/lb tea would deter a buyer away compare to a box of tea bags for a mere $1.99 at supermarkets. Successful marketing is conquer market share. I have never seen a Jasmine tea bag at even the finest non-Asian cuisine restaurants in the states where it's free and mandatory at neighborhood Chinese restaurants. 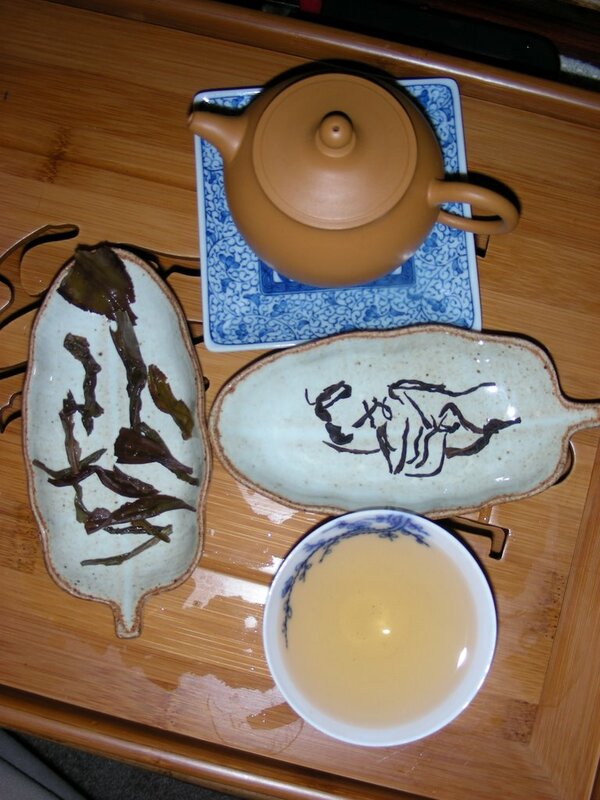 Chinese promote tea as an art, a way of living, yet it's just an other consumer product in eyes of the westerners. India the #1 tea exporter exports Darjeeling to the top 10 tea merchants in the world, 99% low grade tea. It's not a refined "art" they are trading. 4. Sales over specialty/quality. Many producers produce according to market trend, something sells well in the market, within 6 months, 5000 more producers are making the same tea. For example, pu-erh is reviving in the last 10 years, you see all kinds fake products surfacing on the market. The mind set of Chinese business men are focusing on how much money one can make at this moment, rather than developing a consistent line of products and create an identity for itself. 5. Market planning/investing. China tea export business is still at shipment by shipment opportunistic mentality. What it takes is a marketing plan to promote tea as a necessity, not follow market trend, nor a trend either. More than 3 hundred years ago, Chinese tea became known to the western world, however Indian tea is the household item today. That's the power of marketing of laying a foundation for a product. It requires a tremendous amount of time and financing to conquer market share. Living in America and having limited available tea to this side of the globe, I felt it's a noble thing to do to promote the fine "art" of tea, putting my efforts to spread the Chinese tea culture no matter how alone I will be at this task. After reading this article, it's more than just satisfy one's indulgence, chasing that untouchable supremacy. In order to reach that cultural supremacy, one must not forget the baby steps, start from the basic, build a foundation first before reaching the top of the mountain. There is a need to reestablish Chinese tea's global position, we can all contribute with what we can, our knowledge, our passion and our belief. One day I'd be jumping in joy to find even just a bag of Lung Jing or Mao Jian in that nice tea box handed in front of me at any restaurants, be it French, Italian, and even better, a basket full of tea bags at Dennny's!!! It'd be amazing to see that happening during my life time. 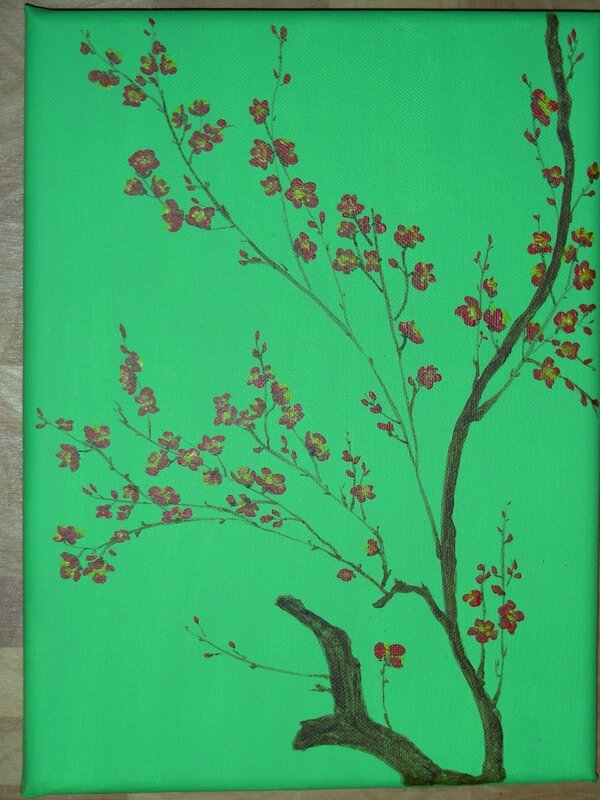 This is my favorite painting so far. I am making progress painting by painting. The small flowers fit well in the 9x12, it's more realistic than previous ones. I was invited to have dinner (hot pot) at my girlfriend's house in the Monterey Park area yesterday. Since I was in the area, WHF is a must visit. I came home with 3 kinds of tea. The Orchid Dan Cong is my favorite. I can only remember part of the name at the store, and the package is labeled Feng Huang Dan Cong. I rely on the label to give me the full and ACTUAL name!!! Although it's fun to wander around WHF, their operation I can make a few suggestions of. The tea lady is friendly because I am a regular, and I am a sucker of any sales scheme. So I end up with 3 tea and like only 1 of them. The other 2 are Da Hong Pao and Wu Yi Shui Xian, both are over exposed or "older". I should learn to be more firm under sales pressure. Today as soon as I got up, I couldn't wait to make some of this orchid dan cong. 2 grams in gaiwan and boiling water for the first try. 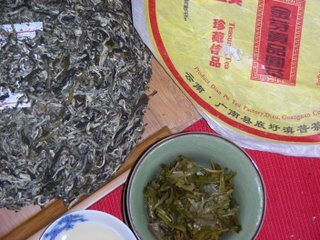 It's full of dan cong flavor and lacking the orchid aroma I remember at the store. I then tried it the 2nd time with 2 grams in a duan ni yixing pot with lobster eye water. The flavor is more intense, that orchid fragrance I remember is all over my mouth, which last for 3 brews, liquid is a little sweet and become more so from the 3rd brew and on. I had a 3rd try with 3 grams in a duan ni pot and crab eye this time. The orchid fragrance is the best at this temperature with more leaves shorter infusions. There is also a cool tingling sensation on top of the mouth. I really like this tea, except I notice a salty after taste in the mouth. I don't know if this is what I had or my body is acting up. I don't assume it's the tea after taste at this point. Best is to try it again in a couple of days. We often talk about tea in terms of its technicalities, the types there are, how it's grown, how it's processed, how to brew a good cuppa and so on. However tea drinking has been a way to pursuit spiritual growth aside of physical and spiritual health for thousands years. In the US and spreading back wards to the east are hypes of health benefit with scientific proofs along with products printed with TEA on cans bottles containing very little tea benefits. Are we regressing here? It has long been documented the benefit of camellia Sinensis thousands years ago plus its effects and side effects. As long as I remember, my parents taught me not to drink tea brewed for a long time, especially tea left in a pot over night. 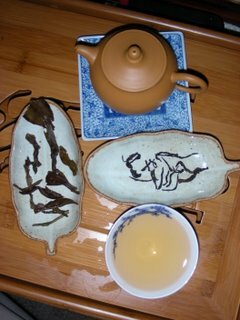 I also read various articles in Chinese which talked about acid in tea become oxidized when left in open air for hours. Like anything become oxidized, it's no longer healthy for your body, or even intoxicates your cells. The harmful effects of left over tea are hardly brought up by scientists of the west. Iced tea, bottled tea, instant tea, powder tea mixtures that are made to meet the demand of today's fast pace, easy to prepared consumer mentality. They are still advertised as cancer preventitives. Made belief media hypes are really not educating our consumers with correct information. Anything spells T E A is not automatically healthy for your body. My mother also taught me never take medication or vitamins with tea. It's a common knowledge among Chinese that only warm water is suitable for taking medication, unlike western medicines recommend water or juice. It's logical that you want to limit chemical reactions of medicine and liquid to take with. PH in anything other than clean water can alter the property of medicine. 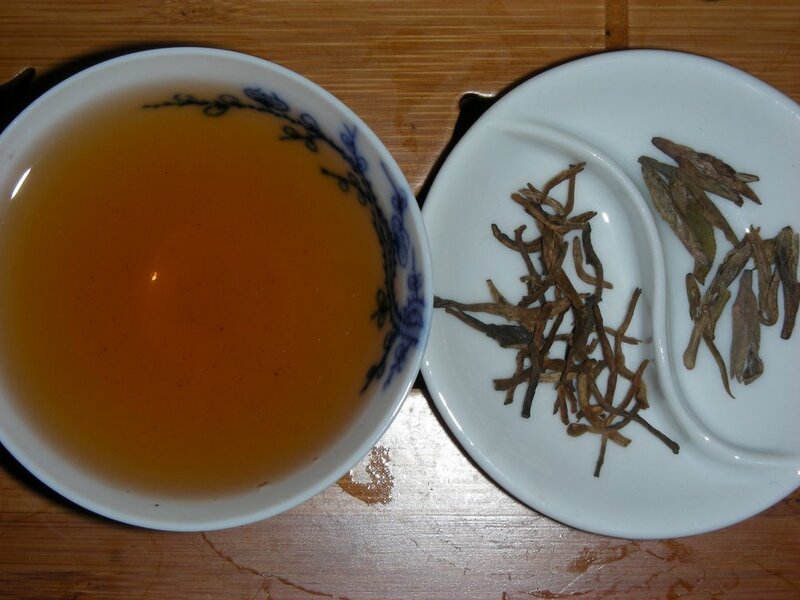 I try not to drink tea 1 to 2 hours before and after taking medications, which is recommended by many Chinese herbal doctors. If you were already a tea drinker, you might as well drink it the right way to FULLY benefit from it. It's much easier to paint on paper versus on canvas. 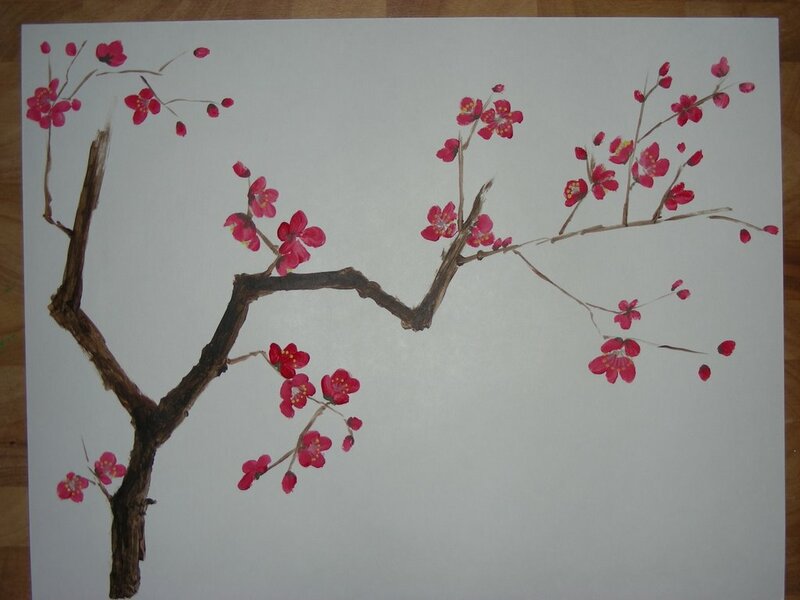 One of the reasons why I am mesmerized by ink painting on silk and paper. Paper and silk are absorbent compare to a gesso coated canvas, the color on paper is more natural and smooth, brush strokes are smoother as well. Some how it looks nicer, the only down side is the durability of the paper. Unless I become famous that my paintings are going be sought after hundreds years later, durability is probably not my first concern. This prune blossom painting can be addictive too, just like tea! Ok, I can't help it. I sneak previewed the You Le wild cake. Its flavor is unlike other wild raw pu I had. Taste like lightly roasted dried papaya, sweet roasty and melon like fruity flavor. Interesting combination. Clean mouth feel, melon sweet after taste. It takes longer steeping to reveal the flavor, even the first couple brews take 20s steeping. There is a hint of minty cool feeling in back of mouth. Unusual combination! Tea from each of the six famous tea mountains in Yunna. It's difficult to identify the distinctive aroma, flavor and other characteristics of tea from different regions if tasted on separate occasions. I feel like experimenting, finding out the subtle differences between each mountains. On this posting, I am on the very first step, the dry leaves contest! I can't see any significant difference by their appearance. Color, composition, size, shape, mixture are all very similar if not the same. I should taste them all at the same time to find the difference in flavor as soon as I recover from lack of sleep. It's easy to taste something and conclude whether you like it or not, but when something similar yet different in subtle ways, tasting side by side is the only way to tell the difference, and it's an excellent way to train your tasting palate.